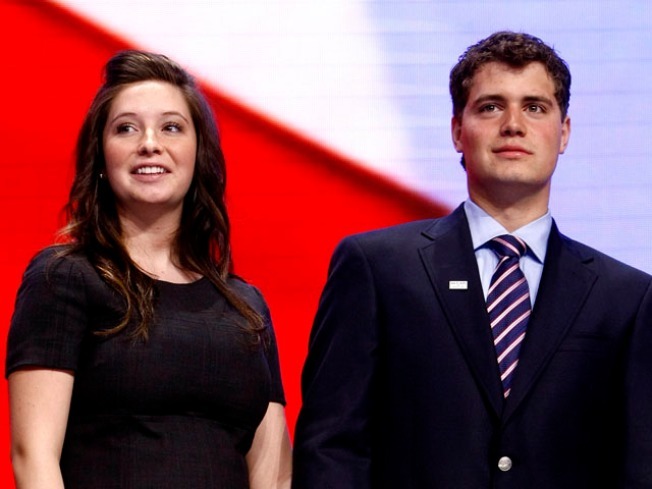 Baby steps: Bristol Palin and her boyfriend Levi Johnston (seen here holding hands at the Republican National Convention) are now parents of a boy named Tripp. Bristol Palin, the 18-year-old daughter of former Republican vice-presidential candidate Sarah Palin, gave birth on Sunday to a healthy 7 lb., 4 oz., baby boy in Palmer, Alaska, People magazine reported. "We think it's wonderful," said Colleen Jones, the sister of Bristol's grandmother Sally Heath, who confirmed the news, told People. "The baby is fine and Bristol is doing well. Everyone is excited." The baby's name is Tripp Easton Mitchell Johnston, according to Jones. The baby's father, Levi Johnston is an apprentice electrician and former Wasilla High School hockey player. He has been dating Bristol for three years. Johnston is studying to become an electrician. He told the Associated Press in October that he and fiance Bristol plan to wed in 2009 and raise the child together. In a statement at the time, Bristol's parents said their daughter "came to us with news that we as parents knew would make her grow up faster than we had ever planned." They added, Bristol "has our unconditional love and support." This week, Levi Johnston's mother, Sherry Johnston, with six felony counts of misconduct involving a controlled substance, described by an Alaska State Troopers spokeswoman as being Oxycontin. Johnston's arraignment is set for Jan. 6.